Already set-up your Qualtrics account? In 2015, the Schulich School of Medicine & Dentistry will be moving from our current survey software, SelectSurveyASP to Qualtrics. We will be working with our customers to provide a seamless transition to the new application. Qualtrics a private research software company that enables users to do many kinds of online data collection and analysis including surveys. By partnering with a proven leader in the industry, we can ensure a single, campus-wide, modern platform for all your survey and data collection needs. Qualtrics comes with its own support center that will answer any question that you may have concerning the creation, editing, and distribution of your survey. With multiple question types and other creative add-ons, you will be able to create the survey the way you want without limitations. The Qualtrics website contains a vast amount of information and should be your first point of contact for finding detailed instructions for your various survey related needs. There is a wide variety of topics listed as well as a search function which allows you to search for a specific topic that may not be listed. If you don't find what you are looking for on the Qualtrics website you can contact them by email support@qualtrics.com or by phone 800.340.9194. If you still can not find your answers, contact the Schulich helpdesk (helpdesk@schulich.uwo.ca or 519.661.2111 x81377). These FAQs will cover questions regarding basic building functions and are based on feedback from you. For more advanced functions refer to the Avanced Building section of the Qualtrics website. Qualtrics is available to all Schulich School of Medicine & Dentistry Faculty, Staff, and Students. How do I set-up my Qualtrics account? 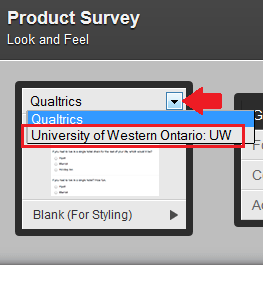 Western faculty, staff, and students have access to create and manage surveys in Qualtrics. Upon your first log in a unique user account will be created for you. Please navigate to the MySurveys homepage. Click the Log In To MySurveys tab. You will be prompted to enter your Western University credentials. Your credentials will use our existing Identity Management (IDM) infrastructure for validation. Faculty and staff click on the Faculty or Staff Member Login link. Students click on Student Login. You will be taken to a Western WebLogin page. Please enter your Western University credentials and click Log In. Your Qualtrics User Account will be created and you will be transferred over to the Qualtrics environment. From here on in, to log into the Qualtrics app, just simply navigate to MySurvey homepage and follow the above instructions. After your first login, your user will be saved along with all of your created and distributed surveys and results. If you run into any difficulties setting up your account contact MySurveys at mysurveys@uwo.ca. Customers own and control their data. Qualtrics treats all customer data as highly confidential, and does not attest or represent the data. Qualtrics uses industry best practices to keep data safe from criminals and hackers, and have devised proprietary methods to prevent disclosing data to the wrong requester due to programming errors. For more information regarding Qualtrics security go to the Qualtrics Security White Paper. 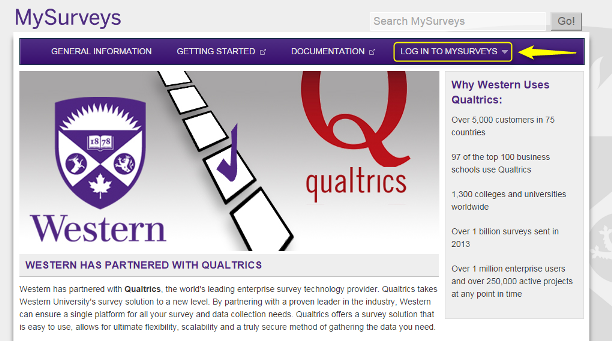 The Office of Research Ethics does allow the use of Qualtrics as an online survey software tool. To address privacy concerns, Qualtrics agreed to host Western’s survey data in Ireland, not the United States. How do I use Qualtrics? Getting Started and Documentation tabs. Here you will find a great source of user-friendly How-to videos, FAQs, and Knowledge Base. The Qualtrics website contains a vast amount of information and should be your first point of contact for finding detailed instructions for your various survey related needs. There is a wide variety of topics listed as well as a search function which allows you to search for a specific topic. Does Qualtrics have the same features as SelectSurveyASP? Yes, all the features available in SelectSurveyASP are in Qualtrics as well as some new features. Visit the Qualtrics website to learn about all the features available. Is there a Schulich template for surveys? No. However there is a Western template you can apply to your surveys. In "Edit Survey" menu click on the "Look & Feel" icon in the top left corner. 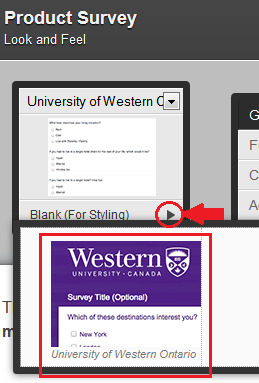 In the Look and Feel window click on the drop-down arrow of the first icon and select "University of Western Ontario: UW"
Then click on the arrow beside "Blank (For Styling) and choose the Western template. Will Information Services have administrative access to my surveys? Information Services will no longer have access to your surveys. That means we will no longer be able to share your survey with others in your department in the event of an absence or staffing change. It will be the individual's responsibility to set up the appropriate collaborate rights. How do I grant other people edit access to my surveys? Using the "Collaborate" tool in Qualtrics you can share your surveys with others and set up their permissions. Note: you can only share your survey with someone who has set up their Qualtrics account. 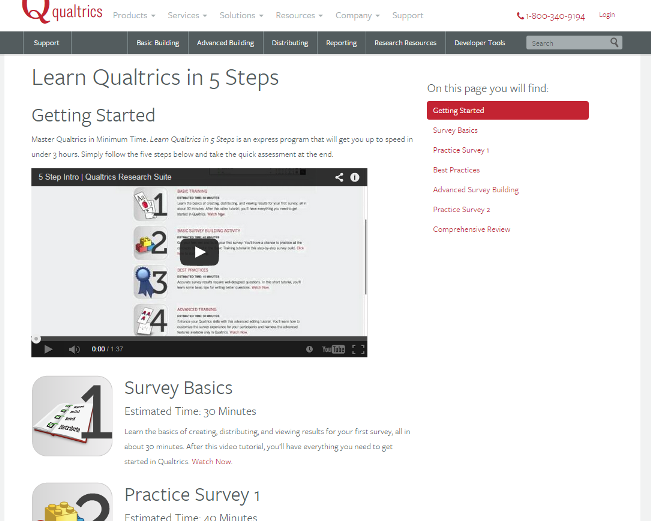 For more information watch the Survey Basics video on the Learn Qualtrics in 5 Steps webpage. Don't want to give someone access to your survey in Qualtrics but want them to review your survey? You can export your survey to Word using the Advanced Options tab at the top right of your survey to export. This is covered in the Advanced Survey Building video on the Learn Qualtrics in 5 Steps webpage. How do I distribute my survey? Once you have created your survey, click on the "Distribute Survey" tab, then click on "Activate your survey to collect responses". The anonymous Survey Link will appear and this means your survey is active. You can copy the anonymous survey link and paste it into an email or on a website. This link is anonymous meaning it does not collect any personal information. This link is designed for open access. How do I restrict my survey to a certain group of respondents? If you would like to make sure that no one takes the survey more than once or if you would like only a certain group of people to take your survey you should use the "Email Survey" function. This opens the survey mailer and allows you to send your survey to a specific list of respondents. Using this function will create a unique survey link for each respondent. For more information watch the Survey Basics video. Note: currently emails from the "Email Survey" function will come from a generic email address noreply@qemailserver.com. Western is currently looking into other options for the "Email Survey" from address. We will keep you apprised of any changes. Can I create unique survey links and send them from my email? Yes. Qualtrics can generate a list of unique survey links which can be exported to your computer and used to send survey invitations from your email address. Visit the "Generating Unique Survey Links" page for more information. This option can be used to reduce the likelinhood of your survey being marked as SPAM. Can data be imported into Qualtrics from SelectSurveyASP? Your current survey results data can not be imported into Qualtrics. It is the responsibility of the survey owners to export any data they require from the old system to their computers. Your current survey questions can not be imported in Qualtrics, however, you can cut and paste your questions into Qualtrics. Once a survey has been created in Qualtrics, you can make copies if/when needed. How do I export my data from SelectSurveyASP? SelectSurveyASP is no longer available for exporting data.